Richmond Rotary contributed $6,000 to the Hope and Relief Foundation, founded by Rotarians, to assist the poorest of the poor in Nicaragua. John Cotterell was able to meet the 25 children who are directly benefiting from those proceeds to support their education, health and meals this year. Some years ago a Rotarian, Frank Huezo, was visiting a Nicaraguan priest in Chinandega Nicaragua and was appalled by the hundreds of children scavenging the city dump for food and anything they could salvage. These children and their families were just trying to survive and education or any kind of hope for the future was non-existent. Through the continuing efforts of Frank and fellow Rotarian Jim Kite, assistance was forthcoming from the clubs of District 5890 and then from Rotary Clubs all over the United States and elsewhere. This has culminated in the formation of the Hope and Relief Foundation that has been instrumental in building and furnishing the Haldor Dubon Callejas school that provided schooling and two meals a day for the "Children of the Dump" so they would have some security in their insecure world and receive an education that would provide them with a chance to succeed in the future. In addition, there have been over 600 houses built in several locations (with sweat equity from the owners), a trade school established, a residential facility for the blind maintained, a pre-natal care facility for needy women founded, and numerous improvements and sustainable projects that provide income and a sense of pride for the recipients. John Cotterell accompanied Frank and Jim with a dozen other Rotarians to see these projects and understand how important our contributions have been and to see the impact we are having on lives. We were also accompanied by a remarkable young woman, Maria Jose Perez, the first student from the Haldor Dubon school to receive a college degree. She is now an Accounting supervisor for an international shipping firm in Managua, Nicaragua. How different her life would have been if it were not for the foresight and generosity of Rotarians. 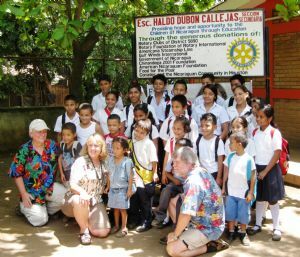 The $6,000 donation to Hope and Relief Foundation from Richmond Rotary was specifically directed to the Haldor Dubon school and on his July trip to Nicaragua, John Cotterell was able to meet the 25 students that are receiving direct support from that donation for their schooling, health needs and 2 meals a day. DG Ed Charlesworth and his wife Robin were on the trip and with John were able to have their photograph taken with the 25 students sponsored by Richmond Rotary. It was truly a proud moment to know that we are able to have such a positive impact on children who need help the most. This activity was so noteworthy that DG Ed made a special acknowledgement to the Rotary Club of Richmond at the District Membership Seminar August 8 and presented John with a book containing individual photos and biographies of the 25 students to share with his Rotary Club. The contents of that book can be downloaded in PowerPoint form from the Download section on home page of this website.